Civilian jobs in law enforcement offer opportunities to work in the field of law enforcement without working as a sworn officer. There are many alternatives to becoming a police officer and still be part of the law enforcement sector. Working with the community is an important facet of law enforcement, and some civilian jobs provide opportunities to help people in your own area. Several factors affect the pay scale for these jobs, such as region, cost of living, budgeting and other contributing influences. Dispatchers and emergency call takers play a critical role in law enforcement, serving as a vital link between victims and police officers. The Association of Public Safety Communication Officials (APCO) offers information about training and certification for this type of civilian job. Indeed Dispatch Jobs: You can search jobs by zip code or view all listings for national jobs. 911 Hot Jobs: Search all jobs or narrow your search by state with this large job board of opportunities. Victim service providers and advocates provide support for people affected by crimes, whether they are victims, witnesses or family members of victims. This type of civilian law enforcement job is ideal for candidates who have experience in counseling, such as social services or psychologists who wish to serve as a link between the criminal justice system and the community. The National Center for Victims of Crime and its program National Crime Bar Association are great resources for those who would like to learn more about this type of career. The National Organization for Victim Assistance (NOVA) provides training and credentialing and utilizes a variety of organizations and service providers to meet crisis and crime events. Military bases have similar positions available for civilians as family advocates. The best way to find victim service providers is through state and local government offices. You can find a listing of the agencies and non-profits that work with law enforcement for various areas of crime, such as theft, child abuse, sexual assault and other crimes. Office for Victims of Crime: This federal government website is a clearinghouse listing for finding state agencies. Once you've identified the agency, you can then search the agency website for open job postings. It requires a little extra leg work, but is an efficient way to ascertain what services are provided by which agencies. Social Service: This is a great job board specifically for social workers in all areas of social services. It's free to register and post your resume. The American Correctional Association offers information about networking, certification and professional development and the Federal Bureau of Prisons provides the overall qualifications for the penal system employment of correctional officers and other positions. USA Jobs: Correctional officers and many other civilian positions are available in federal prisons and are listed on the official government job board. Washtenaw County Michigan, Sheriff Department: This is a good example of how to find local positions through your county sheriff website. A law enforcement agency may hire a civilian investigator to look into many different types of incidents including everything from crimes against individuals to traffic accidents. All Police Jobs: You can find an across the board listing of civilian jobs in law enforcement throughout the U.S. on this website. Glass Door: A well-known job aggregator, Glass Door also offers the unique feature of visitor reviews of companies, salaries and other information. Search options include an advanced search feature. Computer forensics: Central Intelligence Agency (CIA) jobs pay between $73,920 - $136,771 per year. GIS Crossing: Those applying for positions in computerized mapping can search this job board for mapping specialists. 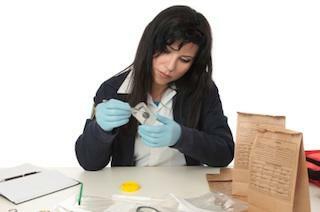 Forensic technicians typically work on call to visit crime scenes. Job duties include taking photographs, collecting evidence and analyzing evidence. If working as a crime scene investigator interests you, a job as a forensic technician may be a good path to take. Crime Scene Investigator Network: This industry website offers a wealth of information for jobs in this field. You can sign up for Twitter feed alerts each time a new job is posted. American Academy of Forensic Sciences (AAFS): This professional organization for forensic sciences offers a free job board for available positions in forensics throughout the U.S.
Crime analysts look at trends in crime and their patterns to help law enforcement agencies determine a plan of action. The International Association of Crime Analysts (IACA) offers training classes, certification exams and conferences as resources for people interested in this field. Intelligence analyst positions are ideal for people with military experience. International Association of Law Enforcement Intelligence Analysts: In addition, to career resources, the IACA has a job board and also offers a RSS feed for new job posting alerts. The International Association of Crime Analysts: An all-inclusive website, IACA offers a job board that features crime analyst and intelligence analyst positions. Office work is an important part of law enforcement. Employees can hold a number of different positions that include research, planning and managing paperwork. Some office employees serve as Public Information Officers who manage communication within the agency as well as the media. Salary range depends on experience and region. Employment Crossing: An administrative job bank touted as the largest in the world. You can find jobs with police departments in all arenas. iHireSecretarial: A specialty iHire job board, this one is especially for clerical positions. Once you register (free), you have access to search for admin, secretarial, and a wide range of office and clerical positions. In your search for a civilian job with law enforcement, you may have quicker results by searching job boards for specific agencies within federal, state and local law enforcement. For example, most state police have a civilian job section such as the Illinois State Police. Directory of State Patrol and State Police: This official directory lists every state in the U.S. with links to the state patrol website. USA COPS: You can find your local law enforcement office by clicking on the map. FBI: This federal law enforcement agency has many opportunities for civilians, especially in IT. Government Jobs: This is a job board for all U.S. government jobs on state and federal levels. There are many jobs available in law enforcement that don't require you to become a police officer. Being part of the support staff or serving in another civilian job is a way to give back to your community. You can help to ensure that those protecting your fellow citizens have the backup and support they need to perform their duty.